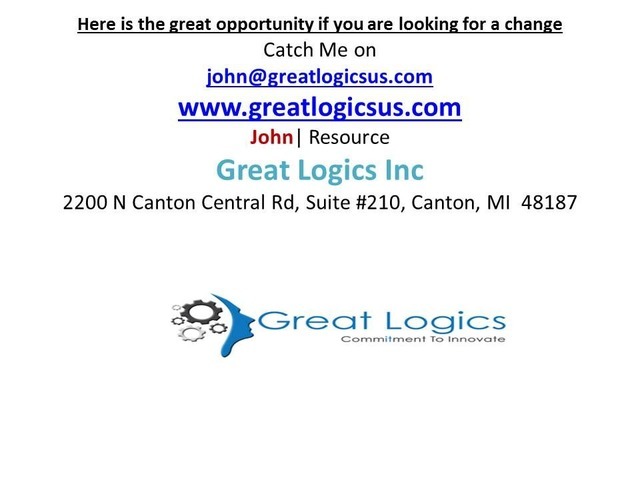 Great logics inc welcomes to all US Citizens. IT is an Enterprise & Analytics Company that specializes in Cloud services, ERP BI Consulting and Staff Augmentation services to Fortune 1000 companies. We are currently seeking qualified individuals seeking project placements. Qualified individuals must be currently in the U.S. on F-1 OPT/CPT, L2, EAD (w/prior experience), H1B, GC, or US Citizens. 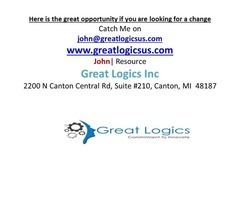 Great logics inc is committed to delivering values to its customers. We are looking for the enthusiastic resources to join hands for a mutual growth. Software professionals who are on F1, OPT & CPT, H1 Transfers, EAD, GC, US Citizens are looking for good career opportunity can apply. NOTE: We provide Training, Interview & Job support for famous IT technologies in market. Our trainers are market experts with 10+ years of real time experience.